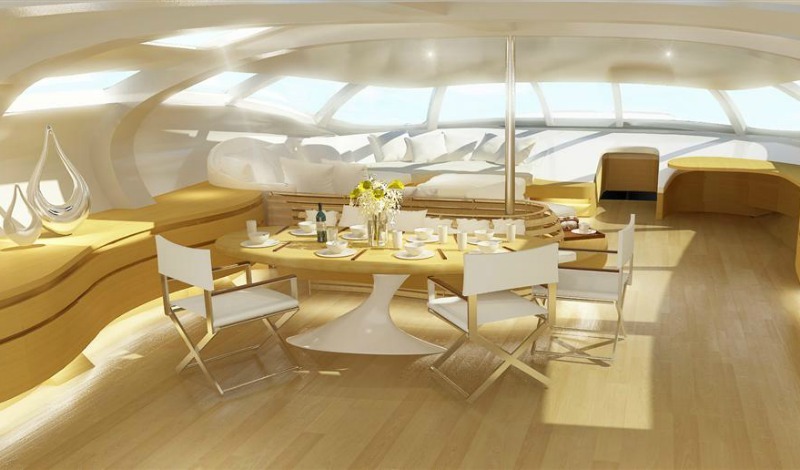 A yacht interior is a true design challenge; you have somewhat limited space, sure. 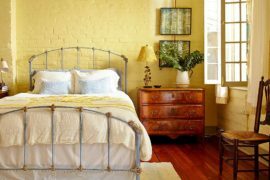 But even tougher is the fact that your whole space is going to move—maybe quite a bit, depending on the whims of the ocean. 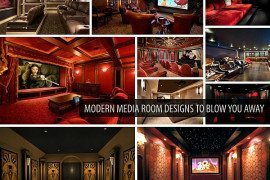 So interior design for yachts is not for the faint of heart, and that’s why, for the most part, it’s a (very) specialized niche. But with limitations come opportunities for creativity. 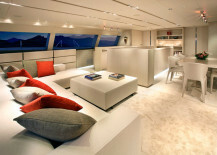 Check out how varied yacht interiors can be. This super-sleek modern interior matches a gorgeous exterior by Alloy Yachts, and was a finalist for the Boat International World Superyacht award. This is a luxurious yacht, built for fast passages and long time periods between destinations. 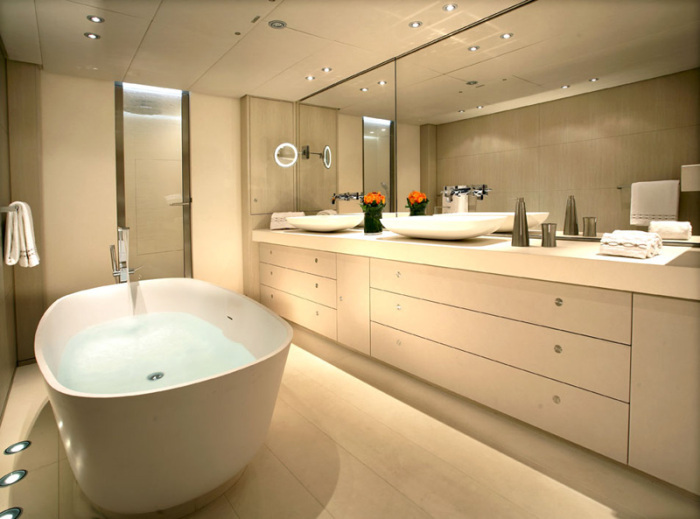 Which is maybe why there is a real tub and a full-size bathroom; who wants to be squished for weeks at a time at sea? 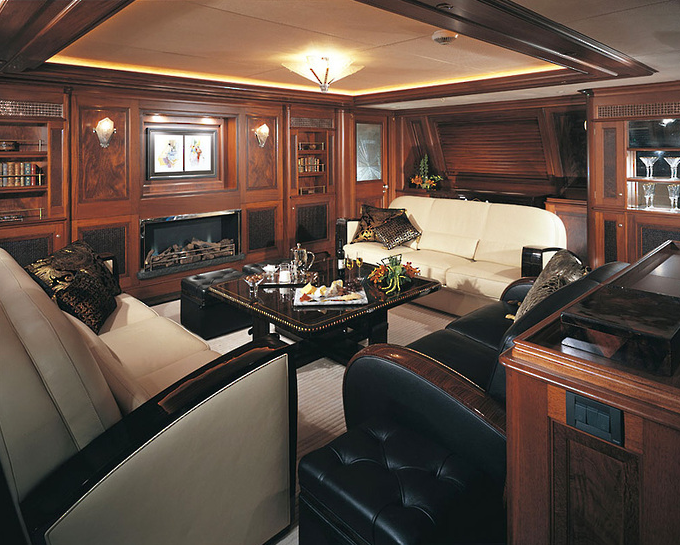 The Tiara is a more classically decorated yacht, with an Art Deco twist. 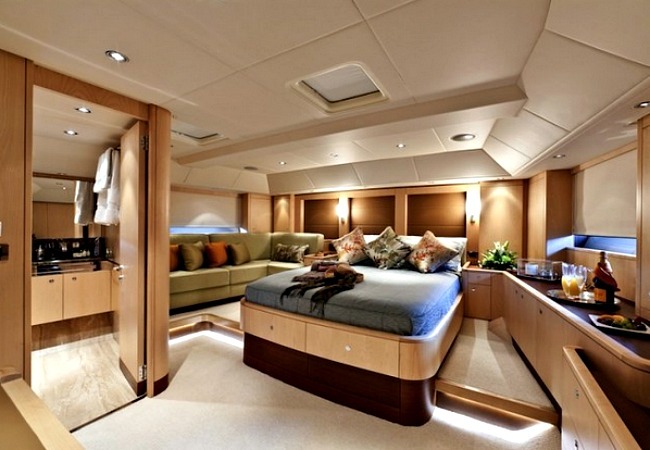 This bedroom is complete with a king-sized bed and fireplace—it’s almost hard to believe it’s on a boat. 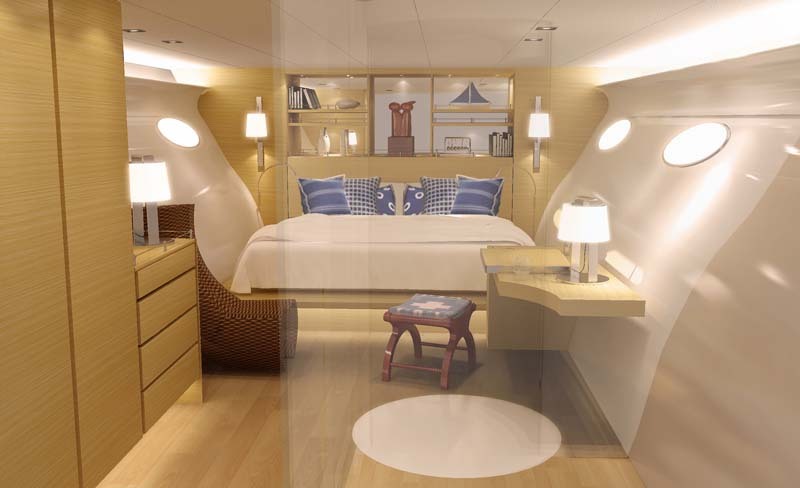 Talk about old-school comfort while cruising—this living room is perfect for putting your feet up after a long day at the sails. 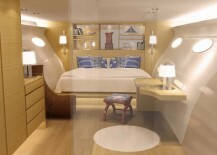 The Adastra yacht was built for a Hong Kong-based couple and took 5 years to design. 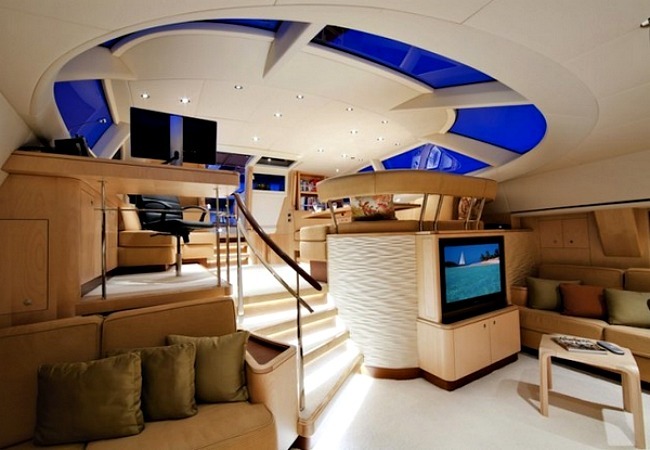 This gorgeous boat can hold up to 9 guests and 6 crew and is designed for long-distance travel. 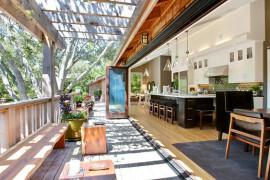 Jepson Designs was in charge of the interior design seen here. 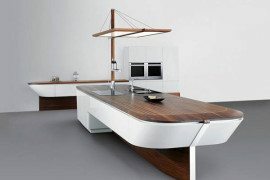 Superyacht MySky is a gorgeous and dramatic combination of super-white leather and marble, glossy black lacquer and Makassar wood. 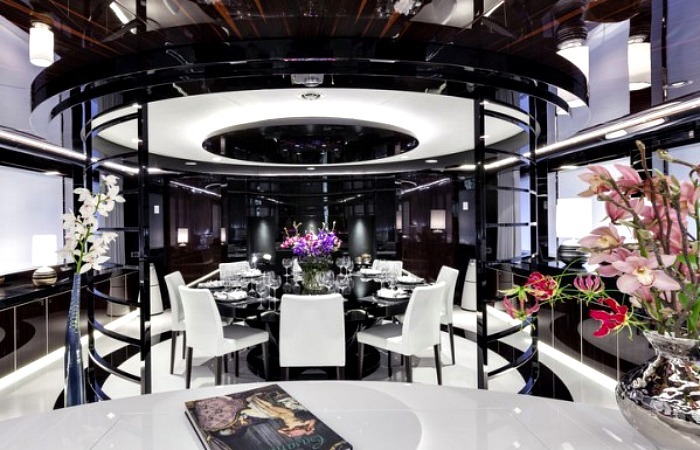 The glossy surfaces and atrium walls with backlit onyx create a moody, modern look in this yacht dining room. The Alcanara is just under 100 feet long, and the designers used that space to maximum effect, with open rooms like this upper and lower salon. 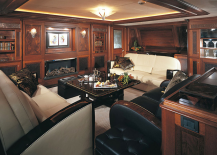 Italian fabrics, marble detail and custom New Zealand wool rugs make this yacht interior classy and comfortable on even the longest of sea-voyages.